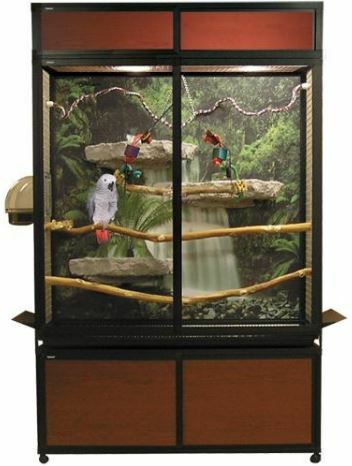 The cage should not be tall and narrow as a cage is for a parrot or cockatiel or parakeet. Those birds are climbers and get most of their exercise through climbing up and down the sides of the cage or branch or whatever climbing apparatus is put in the cage. It's much more natural for your bird to fly horizontally across the cage rather than up and down in a tall narrow cage. And if you have a cage that is both wide AND tall, well, now you have an excellent cage with plenty of room for exercise. We want to keep our canaries as healthy as possible so let's make sure they have room to exercise. 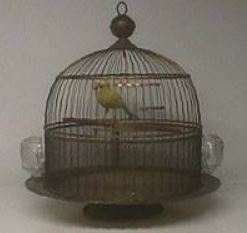 So, your well-meaning sweet Aunt Bessie might say, "Get this cute little inexpensive cage for your canary". Yeah, it's cute...and it probably has one of those fancy Japanese style roofs on it but guess what...there's a good chance that cage is all wrong. And if it is all wrong, your canary may suffer, weaken, and live a short miserable life. How would you like to live in a 5 story closet? It would be impossible for me--even WITHOUT all my wife’s clothes in it! Even pet store employees will often give bad advice about canary bird cages, so don't feel bad if you've picked out the wrong cage. It's not your fault. Cages for canaries should be at least 20 inches wide with 2 perches...one at each end of the cage. This is the bare minimum. In fact, I feel a little uncomfortable recommending 20 inches. 24 inches wide or wider is much better. With at least 24 inches the bird can flutter back and forth between the two perches and get plenty of exercise. An exercising canary is a healthy canary and a healthy canary is a happy canary and a happy canary is a...S-I-N-G-I-N-G canary! 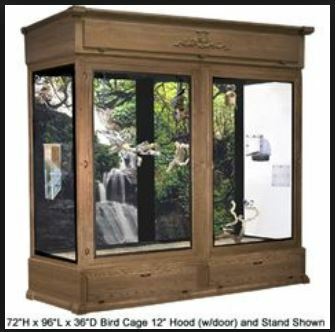 A cage with plenty of length not only gives your pet bird some room to exercise but it gives lots of room to organize his feeders, waterers, toys, and snacks within the canary cage. If your budget is tight and every dollar counts (Hey, I've been there) you can go a bit smaller but try not to go smaller than 20 inches wide. Your pet canary bird needs room to flutter back and forth, get plenty of exercise, and stay happy and healthy. If for some reason you're going to use a small cage--and even if you use a large cage--let your canary out for a flight around the room a few times per week. He'll have a good ole time. Obviously, you'll want to make sure the room is "hazard free". Hot stovetops with pots of boiling water, cats and dogs, and small children can cause problems. Also, make sure all windows and mirrors are covered to avoid collisions at full-speed. With a small pet bird cage, the feeders and waterers almost always have to be placed under the perches. This creates a problem with your canary’s droppings getting into his food. The larger the cage, the more room you'll have for furnishings. Droppings in the seed dish s never good. And that reminds me, always be watching closes for any unusual symptoms that could indicate the beginning of an illness. The bars on the canary bird cage should be no farther apart than 1/2 inch so we can avoid a canary's head getting stuck. Don't get a round canary cage. Your canary will feel more comfortable and secure in a cage with corners. The theory is that round cages confuse him and he'll find security in corners. Of course, that's assuming that the round cage is not very big. A large round cage, 36 inches across for example, would be OK. If possible, try and find a cage that has a slide out tray at the bottom or a detachable base for easy cleaning. Put in a layer of absorbent newspaper, paper towel, or even cardboard, then keep it changed regularly. I'll admit, it can be difficult to find a bird cage that is the proper size and attractive at the same time. But there are plenty of rectangular canary bird cages that are tolerable attractive and affordable. It is just the WRONG size for canaries. They're sold all over the net and in stores as "canary cages" but they won't do your bird justice. Another canary bird cage is the breeding cage. Big enough for a family of canaries during breeding season but also a good size for one canary when the divider is removed. If price is of no concern and you just want to get a really nice canary bird cage check out these beautiful cages at Birdcagedesign.com. Nope, I can't afford those either but a man's got to have a dream! Well, that about does it for size and shape of the canary bird cage. Next...Keep in mind cage location﻿‑‑A subject that could mean the difference between a happy singing canary or an unhealthy lethargic canary. 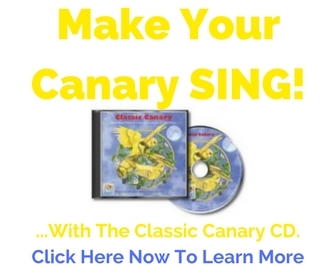 Click here for tips on canary bird cage location.